As part of our best practices, we encourage clients and trainees to utilize hashtags when they interact on twitter. Specifically, I recommend incorporating 1-2 hashtags with their tweets if appropriate. The idea is that other users utilizing that tag might come across your brands content and decide to engage or connect with you. It also can help channel a conversation amongst your current following and unite your community on what is otherwise a fairly fragmented network. The problem is discovering hashtags that are both on-brand and established enough for those brands to join in. Fortunately, tools exist that can help your brand discover hashtags and conversations that fit your message and values. I thought I would share a few of those tools with you here, as well as a few other methods of finding juicy tags. 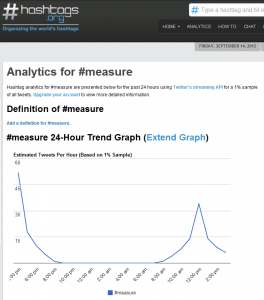 This site provides 24 hours of historical data on hashtag searches, as well as more in-depth data and analytics for paying accounts. Useful for top-level overviews of the popularity of a particular tag, you can use this tool on a daily basis for a week or two to find out how much love a particular tag gets over a longer period of time. The downside is their sample numbers are only about 1% and it only shows you an estimated number of tweets per hour. Their main site also can provide you with some information on rising hashtags in large categories like U.S. Politics or Education. 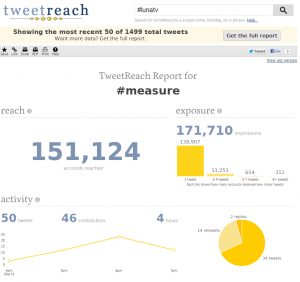 Other insights you can glean from their reports include prolific users of the hashtag and related hashtags. Unfortunately, they obfuscate the 5 most popular hashtags unless you have a paying account, but you can still see information on the 6+ most popular related tags. Hashonomy.com – This tool is no longer available. This site also allows you to search for terms and see popular links shared on twitter related to your search along with their related hashtags underneath. 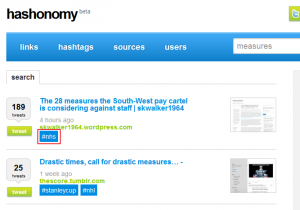 This can be useful both for searching for tags for your own content and for competitive analysis. Beyond their search, you can plug in your Twitter account and receive recommended hashtags from the site itself. You also can browse trending top, and recommended links, hashtags, sources, and users, which can be helpful if you’re looking to interact with particular accounts or users of a network tangential to Twitter. For instance, if know that your audience matches Fabio’s, you could visit his twitter account on Hashonomy.com and see what hashtags he’s been using. Then you could start incorporating those into your content to connect with those fans. Tweetreach is useful for providing top-level insight into the effectiveness of the tweets that you’re hashtagging. It allows you to search for hashtags or other search terms and returns to you the number of accounts reached, the number of impressions for that particular search for the first 50 mentions it finds of that particular term. In order to access all of the data, you’ll need a pro account. Thankfully, you can still get some insight into your hashtag from Tweetreach – is it super popular at one particular point in time? Go investigate that on Twitter by searching the hashtag and investigating individual profiles who come up. It also shows you how many accounts received how many impressions for your search. This is useful for seeing how engaged users are with a hashtag. If they have many impressions for many people, you can posit that there are lots of users using this hashtag to talk to one another. Possibly the best research site, Twitter itself has some great ways to find hashtags that you’re looking for. If you’ve already discovered one or two popular hashtags by reading up on your following, cross reference them with influential users who hashtag frequently. Check out what other hashtags they are using and search to see if they are also popular with their or your following. You can also use the search feature to find audiences who you haven’t engaged with yet. Simply find accounts that are targeting the same audience as you and check out their feeds for tags they use frequently. Similarly, you might take a look at their following or large lists they are a part of and try and discover hashtags there. These are just a small sampling of the tools out there to help your brand find hashtags, so don’t stop at these. If you have a tool or have used a tool you’d like to share with us, leave us a comment below and tell us about it.